SpurTopia - Our Sustainable Living Story: Down the drain? OR Down to the garden! Down the drain? OR Down to the garden! We use ‘grey’ water from our washing machine to water our garden. 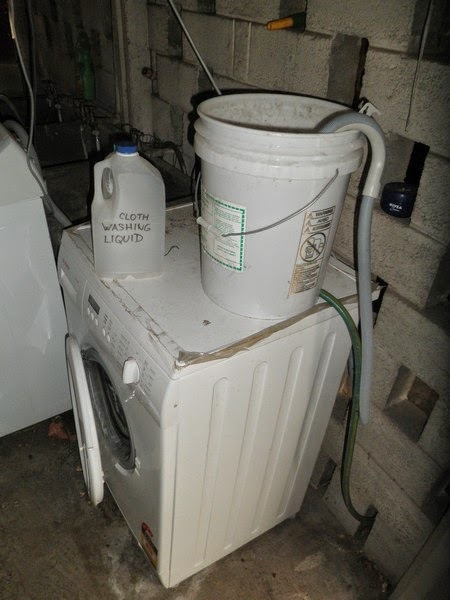 We are fully aware of the fact that conventional laundry detergents and fabric softeners contain a lot of nasty stuff which will make grey water unsuitable, even toxic for a garden. That is the reason we use a home made washing detergent (soap, washing soda, borax) and Citrus Fabric softener (citrus peel and water) which are friendly to nature, very cheap and easy to make (10 Litres of washing detergent for less than $2) and the fabric softener is literally free. Because we know what our home made detergent and softener contain, we are happy to use grey water from the washing machine on our garden. Generally, a grey flex pipe is used to drain water from the machine. However, we did not have a 30 metre long flex pipe between our washing machine and the garden. Instead, we use a 13 mm garden hose and a bucket which collects water from the machine pipe. 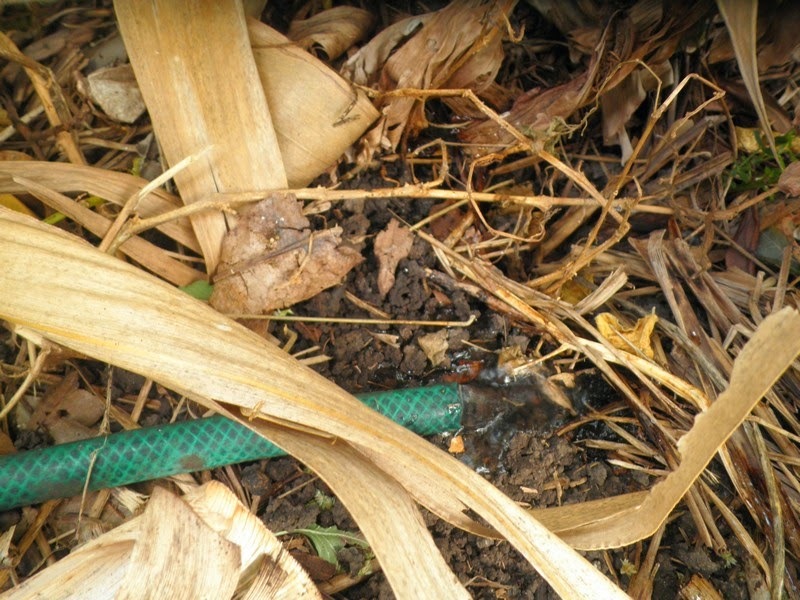 The bucket acts as a buffer water storage from which water is gravity drained via the garden hose to the sugar cane and banana patch. The height difference between the bucket and the plant patch is approximately 1.5 metres. 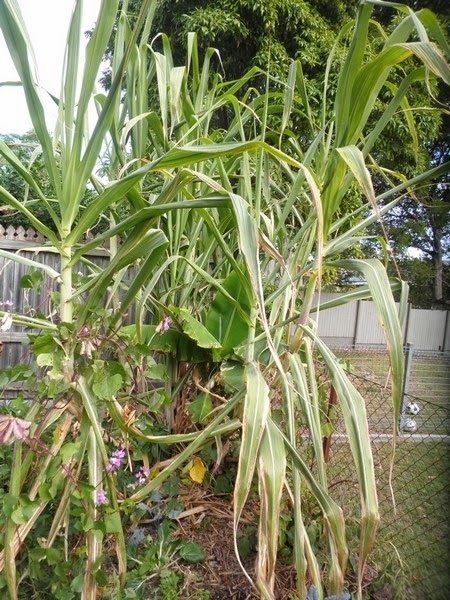 Sugar cane and banana plants love a lot of water and nutrition which is provided all year round. No wonder that even during hot and dry weather, as we had last summer, plants were thriving. Did you know that a top loader washing machine uses approx. 160 litres while a front loader only about 60 litres per load. The average Australian household uses about 30,000 litres of water for a washing machine per year? Every day about 80 litres (8 watering cans) of grey water from a washing machine can be used on a garden rather than going down the drain. Hi, Thanks for the great inspiration! I was excited to see your set-up for grey water and I'm going to do it at home too. I've got the big bucket ready, but now I am not sure about the connection of the hose to the bucket. What fitting do I need to glue into the bottom of the bucket? Can you possibly post a close-u photo of yours please? Hi, the hose into the bottom of the bucket has no fitting. Just made a hole into a bucket nicely rounded and slightly smaller than the hose so it seals off itself. Hope this helps.